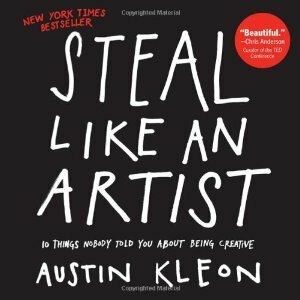 Last week I finished reading the book “Steal Like An Artist” written by Austin Kleon. The book is well written and you will find images on almost all the pages making it easy to consume. It basically took me 10 hours to complete the book. It’s a cool book and I would love to share with you 11 things I learned from the same. Nothing is Original: Austin very well puts it “Nothing is Original” and if you think its original you don’t know the reference or the original source involved. Every new idea is an improvised version of an old idea: Whatever you see in this world, anything! Is actually an improvised version of its old one. Steal Ideas: Stealing is not bad. But don’t simply copy it, improvise it and present it in your style. You’re ready. Start Making stuff: Don’t wait till you discover yourself, don’t wait for that one perfect opportunity. Just go ahead and start making your stuff. Create stuffs you want to create. Fake it till you Make it: Fake it till you become successful, if you want to be someone fake it till you are already that person. Fake it till people start seeing you that way! Perfect Copy: There’s is nothing like a perfect copy! Human mind is incapable of creating a perfect copy! About Writing: Write your first draft on paper and not on your computer/ laptop. Digital devices are good for editing ideas and creating a perfect copy but they ain’t good for generating new ideas. Be Nice: The world is a small place and you want to be nice with everyone. Surround yourself with Talented people: You are 1/5th of the people you spend your time with. If you want to be successful surround yourself with successful people. Keep Your Day Job: Day Job gives you money and freedom from financial stress. Find it interesting? Buy it on Amazon. Next Post Why it is so hard to write a content?